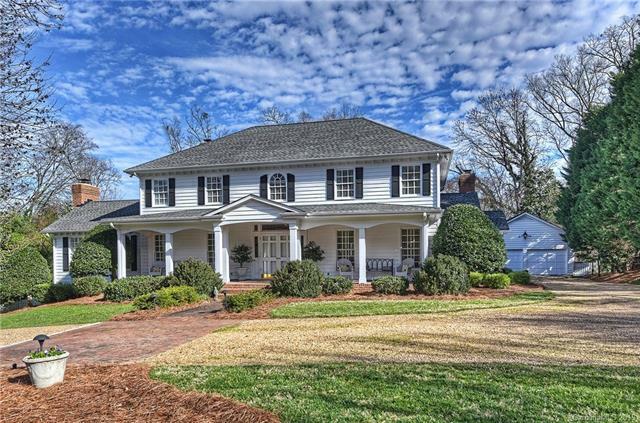 Circular drive leads to this beautiful classic 2-story home on 1.02 acres only minutes to Uptown & SouthPark. Entering, you immediately recognize this home was built for comfortable & gracious Family living. Dining Rm with marble fireplace opens to spacious Family Room with stone fireplace & floor to ceiling windows offering tons of natural light & backyard views. Updated spacious Kitchen is open & bright with white cabinetry, stainless appliances, quartz & quartzite countertops, tile backsplash. Main level Master suite with marble fireplace, sitting area & views. Upper level includes 4 BRs, 2 renovated BTs, small office with built-ins, & computer niche in hallway landing. Large Laundry/Utility Room includes sink, storage, area for hobbies, gift wrapping etc. Enjoy an outdoor Covered Terrace opening to a large Patio & spacious yard. Unique property with over an acre in a desirable area. This is a rare find & a real opportunity if someone wants space and privacy in this busy city!